According to IMDB, Jack Nicholson was considered for the titular role of Benjamin Braddock. Watching this film, the character is so obviously and clearly meant for Dustin Hoffman you can’t imagine anyone else playing him. From the opening shot, framed around the fish-tank, to the final shot at the back of the bus, the character is so clearly Hoffman that the movie wouldn’t have worked without him. That is because Hoffman can play the awkwardness so ably. Decades before Steve Carell and Ricky Gervais would school the world on how to make an audience cringe, Dustin Hoffman effortlessly demonstrates this throughout the whole first act of the movie. His gliding through a party, desperate to leave, his being coerced into an embarrassing birthday present by his parents or best of all, his first proper interaction with Mrs Robinson. This “seduction” scene, culminating in one of the equally worst but best moments in cinema, with Hoffman’s Benjamin unsure where to look with a naked, middle-aged woman stood in front of him, perfectly captures everything that works in The Graduate. Hoffman is so out of his depth, the flashes of nakedness as Braddock struggles with the situation and faultless performance of Anne Bancroft’s Mrs Robinson, as she firmly but clearly propositions her panicking guest. It is this excellent casting that gives the film it’s unique energy. Bancroft is the perfect counter-point to Hoffman and their scenes, particularly the early ones, really sell the humour of the movie. Hoffman trying to be suave in the hotel with a smiling Bancroft looking on makes for some of the more entertaining moments in the film and demonstrates Hoffman’s comedic talents, something many people fail to realise he’s capable of. It isn’t just the casting. 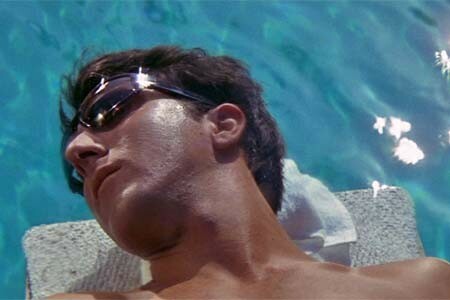 The Graduate has many examples of how to put together a stellar movie. The soundtrack by Simon and Garfunkel perfectly accompanies the film, setting the tone for the more upbeat moments and perfectly backing the mundane reality Hoffman’s Benjamin is living through, with songs like Scarborough Fair or the perfect use of Sound of Silence. It is also ahead of it’s time in direction too. Director Mike Nichols tries shots and staging you may not have seen in the 60s. Point of view shots, takes that switch from location halfway through (and seamlessly) and then framing shots to demonstrate the characters awkwardness, confidence or excitement. Overall, The Graduate is a lesson in how to create a movie. The cast embody their roles effortlessly and sell both the drama and comedy. The soundtrack accompanies the story and enhances it’s effect while Mike Nichols becomes ambitious in direction, in a movie that arguably doesn’t necessarily need it. Previous Previous post: When do horror movies stop being scary?